Your brand new mountain bike is waiting for you in the garage, you’ve got your new helmet and bike shoes, and you’re chomping at the bit to ride some trails, but before you can get out and chase singletrack on that new bike, it’s a good idea to make sure you have proper mountain bike clothing. Sure, you can go out and ride in your street clothes, or whatever outdoors clothes you already have, but you’re going to be a lot more comfortable, and you’re going to have a lot more fun if you make sure you’ve got good dedicated bike clothing first. The most important piece of bike clothing you can own is a good pair of bike shorts. Mountain biking shorts have several key features to help you ride longer and more comfortably. The most important part of bike shorts is the chamois, or liner. This is a padded undershort with a tight fit. The chamois pad gives you a padded contact point with your saddle and keeps you from getting sore, or developing hot spots on long rides. There are several style of chamois shorts. Bib shorts are the most secure, they have suspender straps to keep the shorts up, and often have storage pockets. But they do make it harder when nature calls. Some shorts have an integrated chamois liner that buttons or clips to the outer short. These “system” bike shorts are a good place to start for most people, since they’re guaranteed to work well together. The second part of the short system is the outer, or shell short. These outer shorts should look a lot like regular outdoor shorts, but they have a few important features. A good pair of bike shorts will have a few zippered pockets, so that you can stow your phone and wallet safety, as well as an adjustable waist, and some kind of venting system. These shorts are often made of stretchy, breathable materials that move well with your legs while pedaling. The fit of your mountain bike shorts is a matter of personal preference, but a good rule of thumb is that they should come down to at least the center of your knee. This offers a little protection, and keeps them from riding up. If you’re planning on riding with knee pads, it’s important to make sure they work well with your shorts. Make sure the opening in the bottom of the shorts is big enough for your leg with the kneepad on, and make sure the shorts overlap the top of the kneepad at least an inch or two when you’re seated on your bike. Otherwise they’ll ride up and get stuck above the pad. 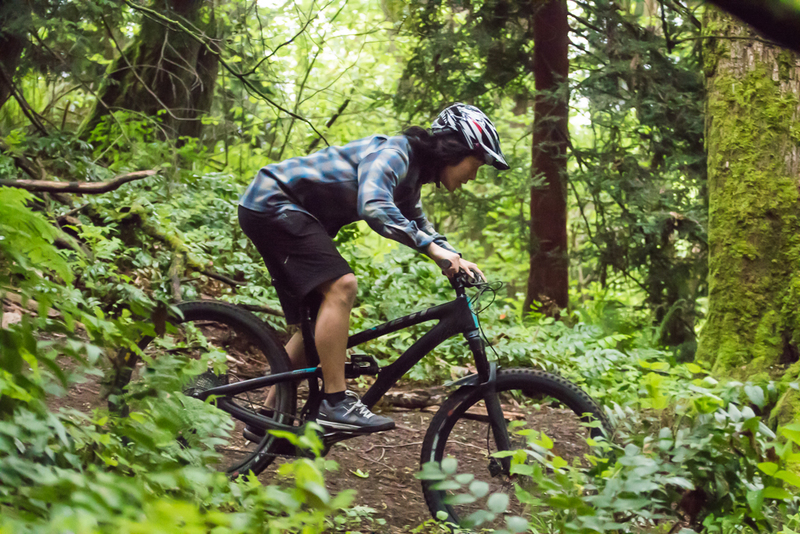 Mountain biking shirts are a little less complicated than shorts, but there are still a few things to look for to make sure you’re in a shirt or jersey that will work well. Most importantly, don’t ride in cotton. Cotton doesn’t wick moisture well, and will stink. Don’t be that rider that smells so bad no one wants to share a tailgate with them post ride. Dedicated mountain bike jerseys often have small zippered pockets for valuables, as well as pockets in the back for food and water. There are a huge range of styles, from tight cross country jerseys, to baggy downhill wear, and even technical jerseys that look like collared dress shirts. No matter what style of jersey you decide to go with, make sure the fit is right for you. On a mountain bike, you’re often bent over a little, and your arms are stretched out. That means it’s vital to get a jersey with good back coverage, and a slight longer hem, as well as longer sleeves. For shorter rides a simple merino wool shirt is often fine, but for longer rides, and extra protection from trailside branches, a dedicated mountain bike jersey is the way to go. So go find a chamois that keeps your tender bits protected, make sure your outer shorts work well with it, and your body, and find a jersey that looks as cool as you feel riding. Then get off the computer, and get out there and ride your bike!